I mentioned the other day that LittleBirder's pansies were blooming. 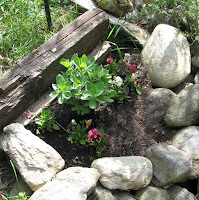 Grandma gave us a sedum as well (and in an unexpected move, I planted it promptly). I understand this will bloom in the fall.